As part of CFA’s initiative to shed light on the many unheralded local filmmakers, CFA is producing a first-ever film retrospective of the life, work, and times of the late Chicago filmmaker Howard Alk. Alk entered the University of Chicago at the age of 14 in 1944, co-founded The Second City in 1959, and went on to become a brilliant and sought after film editor of the counter-culture film scene until his death in 1982. Early in his film career, he became inextricably entwined in the African-American perspective. 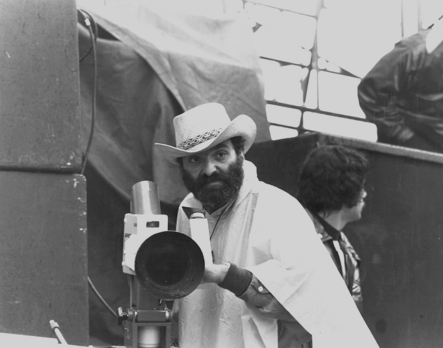 Alk edited composer Ed Bland’s striking avant-garde film The Cry of Jazz in the 50s, and the political documentaries The Murder of Fred Hampton and American Revolution 2 in the 60s. Finding political and social expression within the music scene as well, he edited Murray Lerner’s Festival, a compilation of performances from the Newport Folk Festival; directed Janis, a portrait of Janis Joplin, and collaborated with Bob Dylan in Eat the Document, Hard Rain and Renaldo and Clara in the 60s and 70s. This retrospective will not only paint a portrait of Alk’s short career, but of those complicated and turbulent times. Panelists– Filmmakers Mike Gray, Jones Cullinan, Gordon Quinn and David Rothberg. Many thanks to our sponsors who bring us this programming.